Pansit Bihon With Lechon Kawali Recipe – Eats Yummy! This is the famous good food variety of Pansit in Marikina City, a city in the Philippines. The difference with the traditional one is that they use Lechon Kawali (Pan-Roasted Pork) instead of the usual fried pork. This one is a good food. 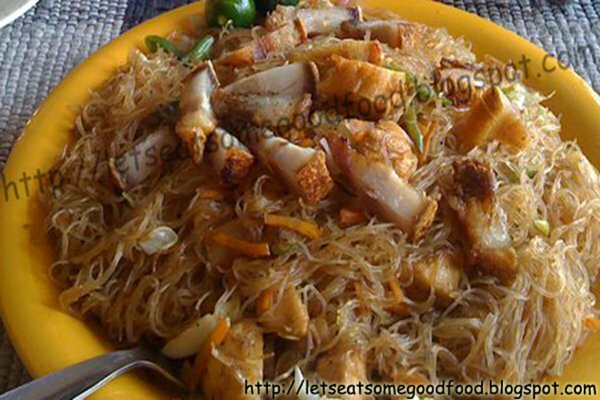 Pansit is also one popular Filipino recipes, and usually a must have on occasions for having it means long life. Heat 2 tablespoons of cooking oil in a wok and saute the garlic for less than a minute and then add the onion and saute for about 1-2 minutes or until transparent. Add cabbage, carrot, and beans and cook. Stirring until the vegetables are almost tender. Pour in water and add the chicken stock cubes and soy sauce. Bring to simmer in low heat. Drain the noodles and add to the wok. Mix well to blend. Add fish sauce to taste. Add half the Lechon Kawali and mix well. Place in a serving platter then spread the remaining Lechon Kawali on top the Pansit. This looks so good. I really enjoy vermicelli noodles. I will have to make this.